Animals are Meat: A Follow Up | Have YOU Ben Starr Struck? ← NEWS FLASH: Once upon a time…meat was ALIVE!!! It’s now been about 24 hours since I posted the photo on Facebook of a free-ranging rooster from a chicken farm near Dallas that I was about to dispatch to become part of the menu at FRANK this weekend. Never in my wildest dreams would I have imagined what a magical 24 hours it would be. I had the occasion to meet a guy once with whom I ended up ranting about how much I love growing my own vegetables/fruit and how much I wished I had more then a balcony’s worth of shaded growing area (that’s all I got right now as a college student). This was his response: “You want to grow your own food? Isn’t that dangerous? How do you know if you don’t mess up and end up poisoning yourself? Why on Earth would you grow your own food?! ?” Part of the reason why I became such a huge fan of yours is because it’s amazing to know that other people who love growing their own food exist in the modern world. Those of us who grew up on farms naturally have that connection to our food’s source. But you don’t have to have grown up on a farm to have it. And you can help your kids have it by participating in community garden programs (which they even have in inner city Manhattan); taking your kids to state fairs and walking them through the animal barns and explaining to them that ALL the animals in those barns are loved pets of other kids their age, and will be turned into meat after the fair to nourish people’s bodies; encouraging your grade schoolers to participate in the 4-H program and your high schoolers to participate in the FFA program. 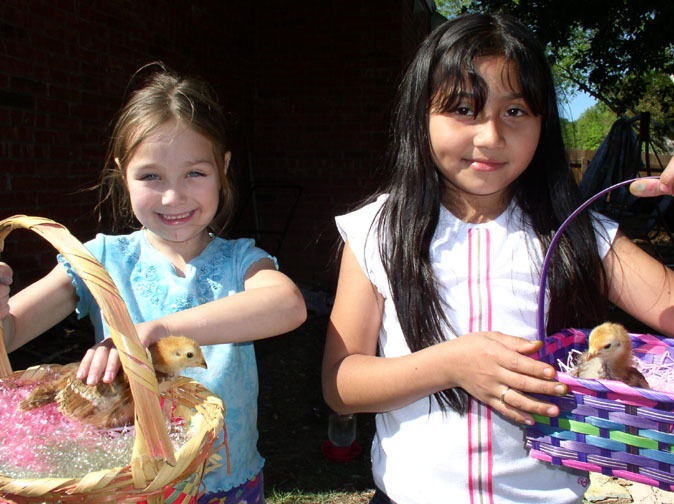 Even if your kids live in an apartment in the inner city, these programs will give them the opportunity to raise crops and even animals at an off-site location sponsored by their schools. I am so thrilled that I’ve been given the voice to be able to reach more people than just the ones in my immediate circle of family and friends. This conversation was so dynamic, and it’s obvious by the charged emotions on both ends that people were really thinking and struggling with the concept. These are the kind of conversations that are incredibly positive and constructive, and really make people sit down and THINK for a moment. I heard through the grapevine that people were giving you a tough time about your chicken-killing rampage. 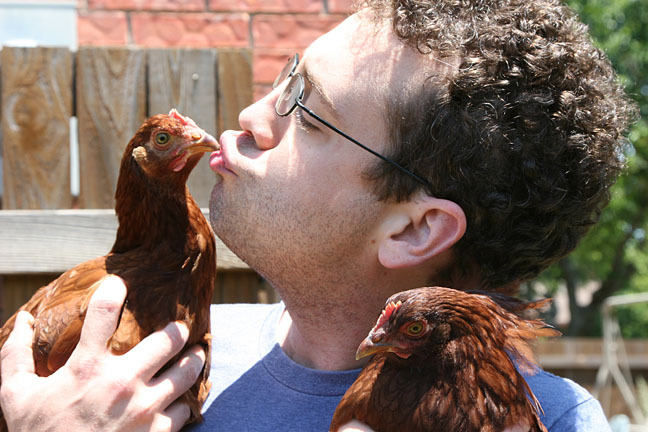 I thought I would share my own story, considering the fact that the first time I ever saw a live chicken up close was when I lived with you and Christian during those four years in Dallas, and for one whole year we raised chickens from the egg right up to their departure (either by natural death, moving to a nearby farm, or being made into dinner). I also remember when we discovered that one of our sweet chickens, who we lovingly referred to as CP, was a rooster! 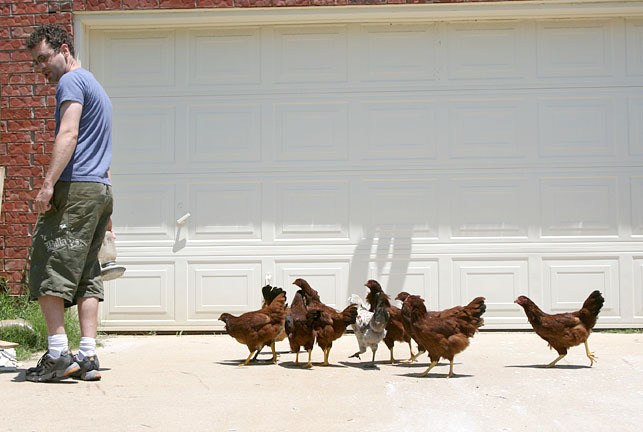 As I recall, where we lived in Texas there was an ordinance against owning roosters because they are loud. So what do we do with him? Well, for me, what we did was we turned him into a learning experience. We decided to have him for dinner! My mother tells me very interesting stories about how her grandmother would kill chickens by grabbing them by the neck and twirling them in the air until their heads pop off, and then their bodies would run around the yard until they fall over. I must admit, the thought was not appealing, still I knew that this was something that was important to see because of all the great points you brought up in your blog post. So we did it. We all gathered very ceremoniously around CP (except for Christian, who wouldn’t have had the heart to actually let any of us go through with it… the big softy), and we chopped off his head. It was fast and he didn’t suffer. To be honest, I thought I would be mortified… but I wasn’t at all. I knew for a fact he had had a really great life eating in our organic garden, climbing trees, bossing the other lady chickens around. If he had been in a factory, he wouldn’t have lived nearly as long or as happily. By the way, he was delicious. His body was treated with absolute respect, and we even buried his poor little head so Christian would never find it… I believe it’s currently under concrete, so that’s definitely never going to happen. What did I take away from this experience? I finally learned where my food came from, and that lesson sticks with me today. Even now, when I make food or go out to eat, if there is meat I eat every last bite of it. If I am too full, tough, I go ahead and at least power through the meat before I give up on the rest of the vegetables/noodles. So, let other people say what they will. I lived with you for four years and know how you treated every one of our ladies. In fact, I think you cuddled with them more than you actually spent time with the rest of us! Also, I don’t recall ever hearing of any other farmer giving their chickens bananas or other tasty treats on a regular basis. These are not things someone who disrespects animals would do. Furthermore, I have never met another human being that cried so many times during the movie, March of the Penguins, so I’m not sure how anyone could possible fathom you as anything but an animal lover. Thank you, T. That’s such an eloquent letter. What he neglected to tell you is that my best friend’s 14-year-old sister felt strongly convicted that SHE needed to be the one to slaughter CP. We sat down and had a long talk with her, and she said that, after meeting my chickens, she couldn’t in good conscience eat another bite of chicken unless she was willing to kill one herself. She was incredibly nervous when the time came, but she did it. And I turned CP into Chicken Parmigiana (his namesake) and she ate him. The next night at dinner, she talked for 2 hours with her family about the experience, and it has stuck with her to this day. Before MasterChef, I only had the opportunity to share this type of knowledge and experience with those in my immediate circle. But thanks to MasterChef, I can now share it with thousands of amazing fans who can join in this incredible dialogue. Cooking, for me, is about far more than the final plate, and whether or not it can please a master like Gordon Ramsay. Since the day I was born, I was steeped in the story of food BEFORE it enters the kitchen. And, to me, being a part of the entire journey of food from dirt to plate makes the experience endlessly rich. I cannot look at this photo without crying. These were my ladies (with CP, the white rooster in the middle, who, soon after this photo, graced our dinner table.) I love them ALL to this day. This entry was posted in Blog and tagged 4-H, 4F, animals, butcher, Chicken, children, community, farm, FFA, food, garden, meat, slaughter, vegan, vegetarian. Bookmark the permalink. 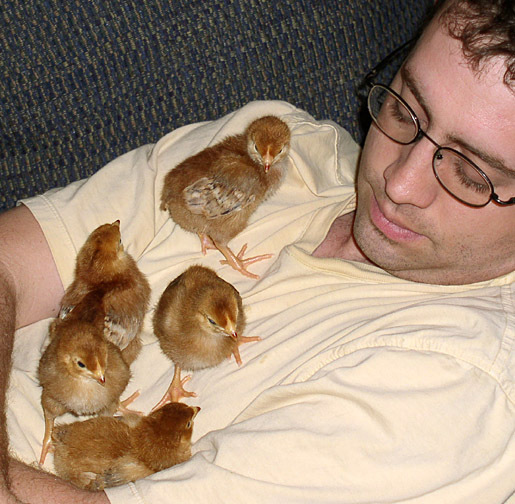 About a year and a half ago, my wife finally let me get some chickens. I had wanted some just for egg production for a long time. 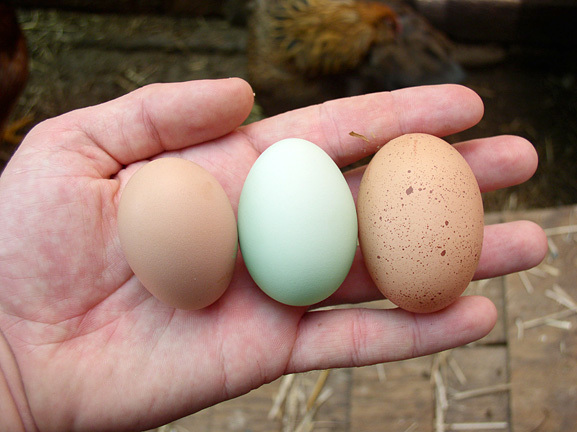 We live in an urban area (where, thankfully, chickens ARE allowed), and enjoy spending time in the backyard with the chickens, watching them do their quirky chicken activities, and of course we love their eggs. My 3 daughters (ages 3,5, and 7) each have a pet chicken that they care for, and they enjoy feeding them sunflower seeds, mealworms (that we raise ourselves), and assorted kitchen scraps. While we don’t plan on eating these particular chickens, it has allowed my wife and I to have conversations with the girls about the source of our foods. We also purchase raw milk from a local farm which allows us to see another of our food sources. I think it’s wonderful that my children appreciate where their food comes from and that will hopefully allow them to make better decisions about their diet as they grow. I also think it’s great that you are using your position to help educate and inform! Keep up the good work. 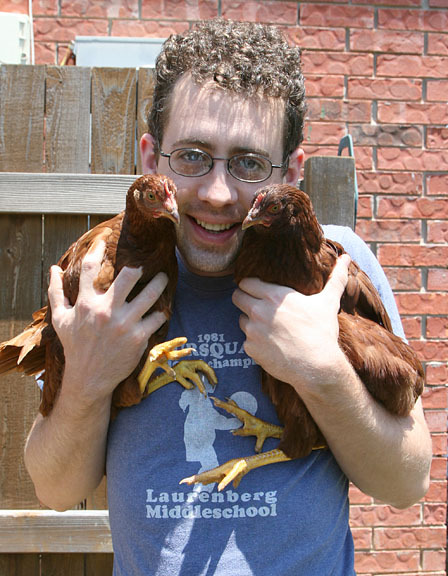 Steve, congrats on your hens! Chickens are the one farm animal that are perfectly adaptable as urban pets (provided you have a backyard)…not only are they endlessly fun to watch and interact with, they produce food for you each and every day. I really hope the backyard poultry movement takes off. I applaud you for getting your daughters involved in the source of their food!!! I found a farm about 90 minutes away that has free range chickens and cows. On their website they say the cows are butchered at 18-24 months and the chickens at 8 weeks. That sounds a bit young to me, especially for the chickens. What is the average lifespan of a cow? What is the average lifespan of a chicken? Chickens, if they’re cornish rock crosses, are big enough to be a decent fryer at 8 weeks. In fact, if you let them get much older, they start to develop health issues because of the fact that they’re bred to gain weight so quickly (heart and leg issues primarily, I believe). If they’re heritage breeds like we have, they have to go 12, 16, 20 weeks to get enough size to be a 3-4lb broiler when cleaned. You should watch Ramsay’s The F Word actually. He raised turkeys and pigs in order to teach his children about the lives of the animals and aligns with what you’re trying to do too. Janet, I love the F-Word, and it’s the only Ramsay show I watch devoutly. After spending 2 months with Gordon, I think it’s the only show of his that truly captures his personality. I was here the day Ben had to give up his chickens and it was a very sad day for him and for me. No one is more of an animal lover than he is. He is the reason I have my second dog Sasha so I KNOW he loves animals and never ever would disrespect them in any way. I grew up with parents who were hunters so I have seen deers, squirrels, racoons, and fish brought from nature to the table and we raised turkeys. I myself could never ever kill anything but I have respect for those who do and do it in a respectful manner. I have Ben Starr struck!!! and proud of it!!! I’m definitely one that could not butcher my own animals. That being said I have great respect for those that do and the life of the creatures and plants we eat. Like you I will not waste meat if I can help it. (There are times it happens and I feel horribly guilty when it does) If I am out, I don’t force myself to eat if I’m full, but I will bring home the leftovers and eat them for lunch the next day. You experiences and frankness are a reminder to us all how precious our lives are, on all counts. Thanks so much, Tigersue! Your blog is lovely and you have a very beautiful family. I have always had great respect for the LDS community for their strong families. I grew up in a very similar family…we gathered around the table every single night for dinner. Rather than TV time, our time was spent together playing games or working in the garden or with the animals. It’s great to see that there are still families like that!